Hello women of God. It's been a long time since I have written for this blog. This is part of a speech that I recently gave for my local Toastmasters group, "Amped Toastmasters". This group helps me find my voice and teaches me skills needed for public speaking. I hope it blesses you. Soar, fly, climb, lift, arise, aspire, ascend, mount. This post is designed to inspire you and encourage you to Spread Your Wings. Have you ever had the opportunity to see a North American Bald Eagle in person? As the national bird of the USA, it represents freedom. It's image is found on the presidential seal, money, stamps and more. What a majestic and intriguing creature. 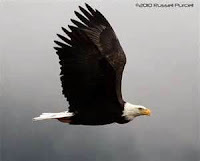 The eagle is a powerful, predatory bird that sits at the top of the food chain. I can tell that it is fully aware of that fact. Eagles exude confidence. The wingspan of an eagle is anywhere between 4 and 7.5 feet. Eagles and their wings are referenced throughout the bible. Eagles do not flap their wings very much, they prefer to soar to save energy. The tips of their feathers are tapered so that when the eagle spreads it's wings, they separate. This helps the eagle to reduce turbulence. I'm not sure how true this is, but I read on several websites that eagles will actually fly directly into a storm. Not only that, but they have very keen eyesight. This allows the eagle to gaze directly into the sun. The N. American Bald Eagle was on the endangered species list for 40 years and it is one of few species to fight it's way off of the list. Let's go over a few specific strengths about the eagle that we can learn from. 1. Confidence-You can exude confidence even if you don't feel confident. Let your body language cover for you. Believe in yourself and your God given abilities. When you believe in yourself, people can sense confidence. Confidence can take you to new heights and help you rise or soar above your fears. When you have confidence you have hope, and when you have hope you feel like you can do anything. You are royalty and there is a King in you. So soar above your storms like the mighty eagle. 2. Save energy by soaring. Eagles don't flap their wings very much and even though we don't have wings, one thing we humans tend to flap a lot is our lips. Flapping your lips or talking too much not only uses up a lot of your energy, it can lead to trouble. He who guards his mouth and his tongue, guards his soul from trouble. Watch what you say and how you say it, not only to others but to yourself. Try not to put yourself down or say things like, I can't. I always tell my girls, if you say you can, you can and if you say you cannot, you cannot. You believe more of what you say about yourself than what others say about you. So what are you saying about yourself? And when you're angry, don't talk at all. You have the right to remain silent and you should exercise that right until you calm down. Let your yes be yes, and your no be no. Your word is your bond so if you say you are going to do something, then do it. 3. Reduce turbulence by separating your feathers when you spread your wings. I translate that into, check yourself before you wreck yourself. We seldom stop to realize how our emotions affect our bodies. Our thoughts and our feelings are integrated with our bodily systems. When you are upset about something, the first thing you should ask yourself is, "Self, am I being selfish?" You see, when we don't get our way, sometimes it hurts our pride and the first thing we want to do is get mad. Somebody is interfering with our time, something is keeping us from getting what we want. The more you keep your mind off yourself, the happier you are. Encourage your friends and pray for your enemies. Always be ready to show love and mercy to others. Realizing that it's not all about you all the time helps you to reduce turbulence in your life. Spread your wings, and fly away. You can soar above your storms. Enter your email address and let His good news flow directly to your inbox! © Bloggers in God Dec 2011. Powered by Blogger.